PowdAir Plus is a patented capsule-based DPI, ideal for these markets because of its advanced simplicity, ease of use and affordability. Most other DPIs have been designed for developed markets and incorporate multiple components and complex mechanics. In contrast, PowdAir Plus is a complete unit with no metal or separate parts. Neat and compact, its novel all-plastic, four-component design minimises manufacturing assembly and production costs, while improving the device’s resilience to frequent use. 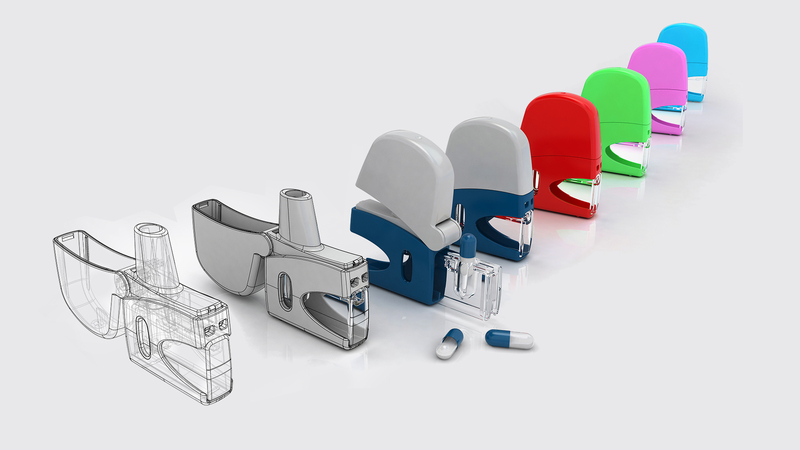 The sleek design of PowdAir Plus makes this inhaler very easy to use. It’s highly portable, and delivers an effective dose of medication with each capsule. Compatible with all capsule types (gelatine and HPMC) in size 3, it can be used with any dry powder medicines. A particularly useful design feature is the way the device opens the capsule as the tray closes. Patients don’t need to pierce the capsule themselves, so using the inhaler is simpler, and there’s no risk of getting the wrong dose. We’ve based PowdAir Plus on an original design by Hovione Technology, specialists in the development of innovative inhalation devices. Our collaboration with them includes acquiring the global rights to manufacture and commercialise this capsule-based DPI, in response to the rapidly growing demand for DPIs across a range of needs.